Washington Doesn’t Have a Spending Problem. It Has a Health Care Problem. Period. 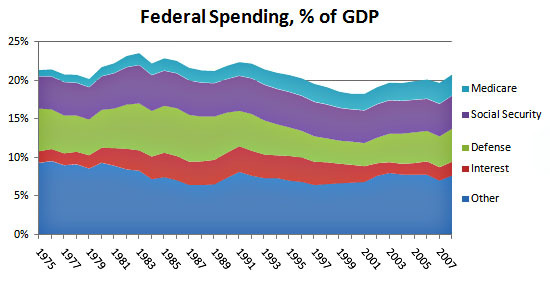 First off, notice that total federal spending is down—not up—from its peak during the Reagan-Bush years. More specifically, the category that contains domestic discretionary spending and miscellaneous mandatory spending (“Other”) has been on a steady downward slope for decades. It spikes a bit during recessions, but that’s about it. Interest expense is also down. Defense spending swelled back up to late-80s levels after 9/11, but is otherwise down over the long term too. And Social Security spending is pretty flat, though it will go up a point or two over the next few decades before it levels out again. The only category that’s on a long-term upward slope is Medicare. In other words, we don’t have a discretionary spending problem. We don’t have an interest expense problem. Once we withdraw from Afghanistan we don’t have a big defense spending problem. And Social Security, at worst, is a very small and very manageable problem. Our only serious problem is Medicare, thanks to an aging population and rising health care costs. That’s it. End of story. If you actually care about federal spending, that’s the only thing you should be focused on. Pundits and talking heads who complain generically about “out-of-control spending” are either (a) ignorant of basic budget facts or (b) engaged in agitprop. NOTE: This chart deliberately stops at 2008 in order to show historical trends more clearly. The numbers in the chart have spiked over the past four years because the recession has temporarily depressed GDP and temporarily increased spending, but that spike will disappear naturally as the economy recovers—just as it has after every other recession. It’s not an indication of a long-term spiral in federal spending.